The Grand Canyon is one of the most stunning locations in the world. If your group wants to see this natural wonder, charter a bus with Ground Travel Specialist for a fun, safe trip to one of the most beautiful places you will ever see. Ground Travel Specialist (GTS) is the premier choice for groups of any size who want to charter a bus. Our buses are clean, safe, and feature all of the modern amenities any group needs to make the trip more fun and more comfortable. Call us today to learn more or to book a bus for your trip. 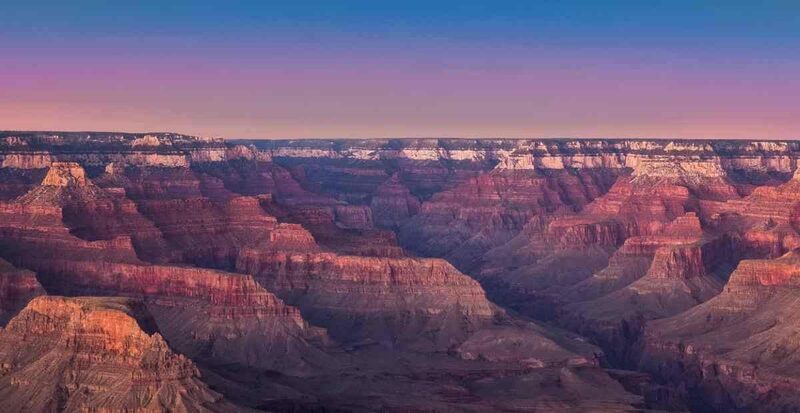 The Grand Canyon is more than 275 miles long, and was formed by the Colorado River over millions of years. At its widest, the canyon is 18 miles across and it reaches depths of 6,000 feet in some places. The Grand Canyon became a National Park in the year 1919, and it was the 17th National Park. The rock at the bottom of the canyon is approximately 2 billion years old, while the rock at the top is more than 230 million years old. More than 5 million people from all over the world visit the canyon every year, but thanks to the canyon’s size, very rarely will you have to deal with large crowds. Whether your group is a collection of sightseers who are trying to experience all of the natural wonders that America has to offer or you are leading a church or scout group to this incredible place, GTS would love to help. There are many places to view the canyon from, including the Skywalk — a glass walkway that stretches 70 feet out over the canyon at a height of 4,000 feet! If you like to raft or camp, there are many great locations nearby, and you can obtain a permit to camp in the canyon from the park system. Make sure to submit your application well ahead of your visit, as nearly half of all annual applications are denied. With the right planning, your camping experience will become a once in a lifetime event that everyone in your group will remember forever. A significant portion of the US lies between Detroit and Arizona, so make your trip even more fun by stopping at other significant geological or historic sites along the way. Contact GTS today to charter your next bus trip! Every one of our vehicles is thoroughly inspected and tuned-up before each trip in our own shop, and all of our drivers undergo a rigorous background check and training. Our buses feature tons of storage space, comfortable seats, a PA system, an audio-visual system, and charging ports. There is no better way to travel with a large group so call us today for more information or a quote. We look forward to taking you where you want to go!